Fig 1. Angle selective skylights. Fig 2. A large light spreading skylight Fig 3. Pre-formed angle selectives. Makes skylights and atriums more practical by leveling the sunlight input during the day. Increases the sunlight input during the three hours after sunrise and before sunset to increase illumination to the interior at these times. Decreases the sunlight input around noon in summer to reduce the thermal load to the building. Simple installation by incorporating laser cut panels in large skylights or pre-formed self-supporting configurations in small skylights. 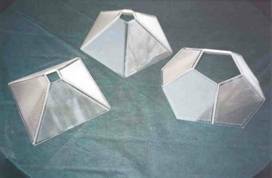 Can be used in inverted form to spread light inside the interior of a building. The diagrams on the left below show that a basic roof opening admits too little low elevation light and too much high elevation light. In the right hand diagrams the skylight is made angle selective by adding laser cut panels in gable or pyramid form. Now, more low elevation light is intercepted and and redirected down into the building. Also, high elevation light is redirected by one panel across to the other panel and out of the building. For simplicity all light incident on the panels is shown as redirected. In fact, all light is redirected at only one angle (see laser cut panel). Away from this one angle an increasing fraction of the light passes directly through the laser cut panel reducing the effect shown in the diagrams. Under actual skies, a diffuse component that is incident from all directions must be added to the effect. However, overall, a more even input of illumination over the day is obtained by use of this technology. 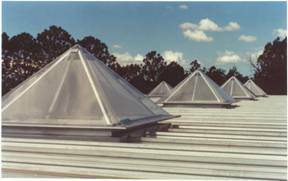 For rejecting more high angle light a sharper angle gable or pyramid is preferred see Heat Rejecting Skylights and Atriums. For admitting more low angle light a lower angle gable is preferred see Improving the Performance of Light Pipes. 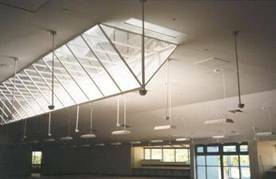 COMMERCIAL INSTALLATIONS : see Advanced Daylighting Systems in Norman Park School. COMMERCIAL : Australian patent 2003252881 Method for producing a three dimensional structurally self-supporting angle-selective skylight. Exclusive rights to manufacture and market this product in Australia currently licenced to Skydome Skylight Systems Pty Ltd. www.skydome.com.au/products_skytubes_home.htm.